“Hey, have you heard of Mumford & Sons?” Shout-out to Big D, President of UBG who has since moved out of the DC area. Big D discovered Mumford. He introduced us all to Mumford. After the first album came out, UBG made a trip to see them at Merriweather last year. AMAZING show, despite us watching in the middle of the worst thunderstorm I’ve ever been caught in the middle of outdoors and not being able to run for cover. Very interesting. Anyway, my point. Mumford has since come out with a second album. It’s a great album. I really would love to see them; would absolutely love it. But, without a doubt, they sold out immediately. They actually have two shows in the DC area in February. Both shows sold out. Ticket prices keep going up on stubhub. Now they are at $180 each, and that is the lowest I’m currently seeing. So, if someone can find it in the goodness of their heart to get me a ticket to Mumford & Sons, I will forever love you. Just a thought to all those Sara admirers out there. Happy New Year! Since we are only 3 days in I figured this was appropriate. Clearly, I need to get back into online dating immediately. And yes, it would only be for the blog. Because I’d like to introduce another new friend to the blog. We stole her from ABG. She moved to DC from Arlington and now I’d like to indoctrinate her into UBG as soon as possible, because she’s actually kind of cool (unlike the rest of ABG). For those who don’t recall, UBG is the U Street Bike Gang which I and 15 others are a member of. ABG is our competitor, the Arlington Bike Gang. They don’t roll as deep but they may be a little more serious about biking. Anyway, this new friend (or acquaintance, depending upon how you look at it) also bikes so that is a plus; we need more serious bikers in UBG to compete with ABG. But I’m digressing yet again. Allow me to introduce Gwyneth. Gwyneth, welcome, and thank you thank you THANK YOU for this material. Gwyneth was catching up on my blog and upon reading it, realized she has very similar online dating material. In fact, just two days ago, she received a very compelling email from a guy she went on an hour long date with. His blog name will be Jonathob (see below). You see, Gwyneth didn’t really feel any chemistry with Jonathob so immediately put the kabosh on the date without further adieu. And with good reason. Take for example this string of text messages sent after said date, which generated absolutely no response from Gwyneth but yet still drew more text messages from him. But it doesn’t end here. After not responding to ANY of the above text messages, Gwyneth received the following email from Jonathob. She received this little piece of heaven not a week, not one month, but two…I repeat, TWO months after their date. Clearly, she made an impression on him. Hi. So, I was just reflecting on my recent experiences on this website, and I just wanted to say I think it’s kind of lame that we didn’t meet up again. It seemed like we both had a really good time when we met up. 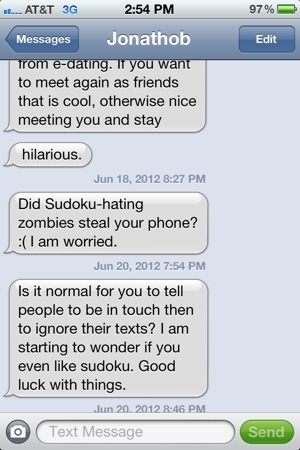 I’m pretty hilarious, and even though you are way too serious about everything, it seemed like you liked sudoku, which is obviously very important. Wait, WHAT. There is so much going on in that last sentence that we must take a minute to reflect. My current working theory on why you didn’t respond to my texts was that you may be one of those people with weird rules, like don’t right [really?] after meeting, wait X days, etc. I don’t really care for that type of rule — I can tell pretty quickly if I like someone or not — so I don’t see the point of playing the waiting game. I was in a bit of a weird place though at that time, so I probably came off overly aggressive in my texts, though I think that was mainly because I am pretty sensitive and took it personally when I didn’t hear back. I wouldn’t be interested in dating somebody who couldn’t take ten seconds to tell me they liked meeting me, but we still could have met up as friends afterwards (not to imply you’re not hot, just that you’re probably not sensitive enough about other people for me. It’s common practice for people to analyze why someone didn’t call them back or to guess what happened, but Jonathob chose to actually vocalize it to the person who was doing the ignoring. Does he think this email will get him somewhere? Perhaps garner a response? What exactly was the point of this email? Anyway, that’s all I wanted to say. Generally, I feel like my opinion about things is usually right, and I want to improve the world, and make people think, so I am happy to broadcast it. Oh! He’s trying to make the world a better place. He is usually right, and obviously he is right by demanding that Gwyneth respond to his texts and emails. I bet when she didn’t respond to this email, it simply infuriated him more. I’m not expecting a response and I’m not planning to write again, I just feel like it’s lame that two people who seemed to enjoy meeting up couldn’t do so again for whatever reason. Good luck with stuff. I did enjoy meeting you, even though I think your text-ignoring behavior was pretty lame. And I hope this message finds you well and doesn’t come across as sour grapes or anything weird, just figured I’d share my two cents, because I am full of riches and I enjoy being a beacon of light in the world. 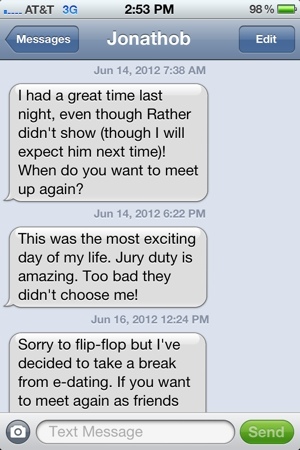 And this, folks, is just another example of what we women have to look forward to dating in DC. 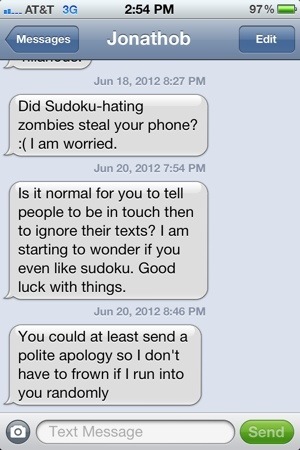 Hilarious, sensitive, soduko loving beacons of light just trying to make the world a better place by responding to a text message. I’ll get back on okcupid tomorrow. What did my father say? I cannot stop laughing about this. First of all, the JoP was basically a drill sargeant, so she was NOT amused by his response. Secondly, he was not kidding when he said this. I think he was so nervous about the whole thing that it was the first thing that came to him when she asked the question, that is, after he realized it was him who was supposed to respond. Thirdly – ’tis I?’ Dad, have you been reading some Shakespeare lately? Hysterical. GOLD. Thanks Dad for the material. Can’t wait for Jean’s wedding in January to see what else you’ve got.